Groundbreaking for Hornet Commons, a Sacramento State student apartment complex on the southeast side of campus, is scheduled for May 2019. Construction is expected to be completed before fall 2021. The California State University (CSU) Board of Trustees on Jan. 23 approved the final public-private development agreement and schematic design. 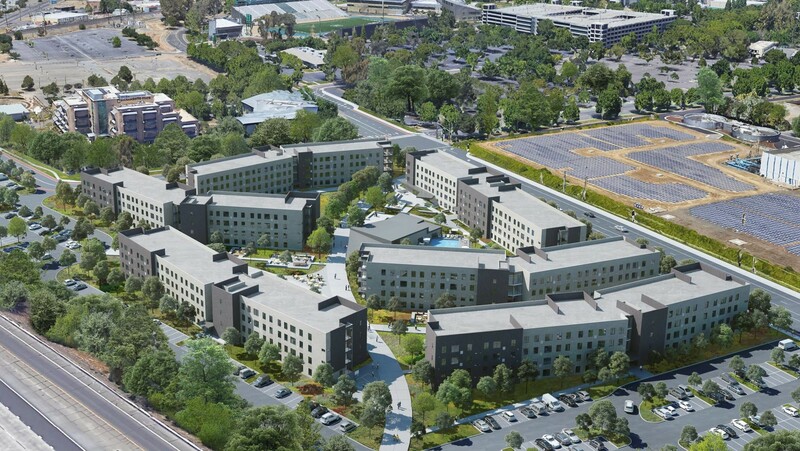 The $164 million housing project for upper-division students will boast 284 apartments and 1,100 beds in six four-story buildings surrounding a swimming pool and a residents’ common building, which will contain a cafe, fitness center, and community room. Hornet Commons “will engage the resident students in the campus community and enhance their learning experience, thereby contributing to our goal of improving retention and graduate rates,” Nelsen said. University Enterprises, Inc. (UEI), Sac State’s authorized commercial-services auxiliary, is purchasing the 11.5-acre site, previously home to the Dan McAuliffe Memorial Ballparks, from the city of Sacramento. The purchase price is $2.3 million, plus the cost of building a replacement ballpark. In addition, Sac State leased the adjacent 1.5 acres of campus-owned property to UEI to increase on-site parking to include 546 spaces. Greystar, a global leader in rental housing, is responsible for building, financing, operating, and managing Hornet Commons. Sacramento State and UEI will support the project but provide no funding. Greystar is reimbursing UEI a total of $5.7 million, which includes the $2.3 million UEI paid for the land and other transaction costs. UEI is leasing the land to Greystar for 85 years, after which Hornet Commons will revert to UEI. "We are excited about adding 11.5 acres to the campus' footprint and thank the city of Sacramento for working with us," said Jim Reinhart, UEI executive director. "Adding 1,100 beds to the supply of on-campus housing will help to keep market rents reasonable for our students." Steinberg Hart is the project architect, and Sundt Construction, which is building Sac State’s Ernest E. Tschannen Science Complex, is the general contractor. Brailsford & Dunlavey provided advisory services.